So the lap that Tepstra gained in the Derny wasn't given, anyone know why? Not sure, conflicting info. Maybe the derny, perhaps the elimination. There doesn't seem to be any official info on the web site. De Buyst and Ligthart get over 400 but not anothe lap?! But I'm happy for Terpstra and especially Havik after the accident of his grandad. del1962 wrote: So the lap that Tepstra gained in the Derny wasn't given, anyone know why? do not count as per UCI rule 3.2.245. Akuryo wrote: De Buyst and Ligthart get over 400 but not anothe lap?! Bonus laps can't be gained in the final madison. Laps must be gained by real distance in that event. Anybody know if Terpstra is scheduled for Gent? Dazed and Confused wrote: Bonus laps can't be gained in the final madison. Laps must be gained by real distance in that event. But he will ride Rotterdam with Keisse again. That I know for sure. Dazed and Confused wrote: Bonus laps can't be gained in the [B]final madison. [/B] Laps must be gained by real distance in that event. yep, this one in particular can be critical, but I would cut them some slack this time around as its not often we get six days on Eurosport. Dazed and Confused wrote: yep, this one in particular can be critical, but I would cut them some slack this time around as its not often we get six days on Eurosport. Where I live, Amsterdam is the first 6 day they've shown as far as I know. lemon cheese cake wrote: Where I live, Amsterdam is the first 6 day they've shown as far as I know. Pretty remarkable considering the low cost of production etc. But of course there got to be an audience for it to work. Good to see Dillier expanding his six days experience. No live stream (boo), but there will be live result updates on the website. Is that real? Whats the story with the cat? The venue ('t kuipke in Ghent) is in a shamfully bad condition, so my guess is it got in from the outside through some hole in the wall. Journalists are trying to find out the owner. Still a 4 (perhaps 5) way competition. Could be difficult to control for Keisse/Cav as we more forward. I think De buyst/De ketele will take it, but the competition is very tight. It was an intense and nerve wrecking finale with De Buyst/De Ketele managing to hold Keisse/Cav at bay. 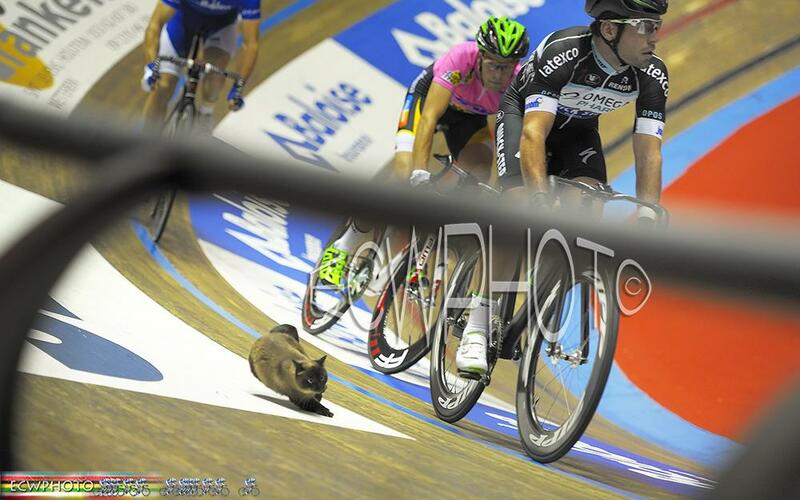 Keisse/Cav gotta be pretty fired up by now, but this will be hotly contested for sure.